ThreatRate is a global risk intelligence company, dedicated to providing the most comprehensive and always updated security analytics and insights, to ensure the safety of our clients while conducting business at home or abroad. Our analysts, security consultants, and global partners provide our clients with a wide range of security solutions to alleviate and respond to any security challenges they might face. Our propriety data and analytics span over a decade and across all countries, sectors and threat areas with deep bench strength in K&R. The ThreatRate Reports and customized threat deep-dives provide clients country and region-specific analyses and actionable insights to support and improve their risk management strategies. 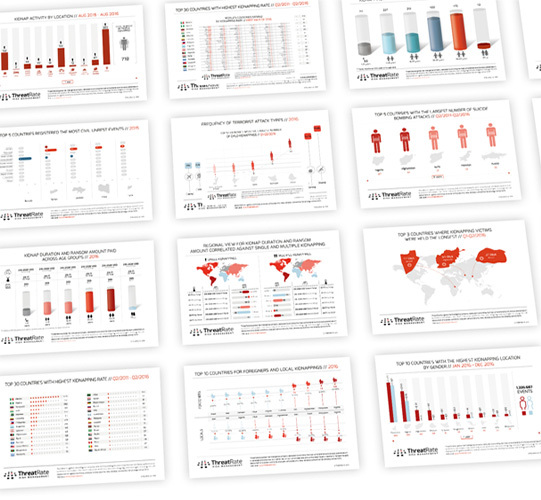 ThreatRate publishes 100+ reports and infographics annually ranging from region and sector focused Indices to deep, cross-threat Intelligence Reports to highly topical Insight Reports. Clients enjoy access to ThreatRate’s research, data, and customized dashboards as well as expert consultation.